Save your shocks unnecessary wear and tear from abrassive dirt, sand and grime. 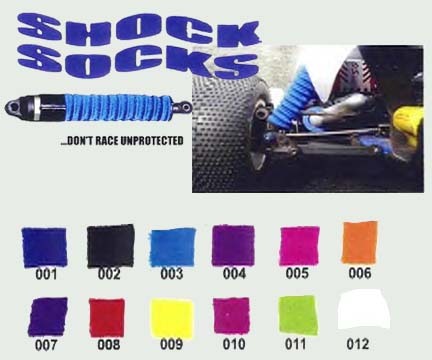 Extend the life of your shock pistons and seals by protacting them with a set of Shock Socks. They come in many colors so you can match them to your body or to your chassis. These will add a whole new look to your truck and save you some money and time on rebuilding your shocks. These are machine sewn by Tate Van Gough out of Atlanta Georgia. They are easily removeable so they can be washed time and time again. They are available in all the colors you see above. You can also have custom mixes made. We can take two of your favorite colors and do two tone socks. One pack will cover four of most sizes of offroad shocks. One pack can easily cover two sets of onroad shocks when cut in half with scissors. Shipping anywhere in the US is $2 or $3.20 for priority per order. We keep most colors in stock and are ready to ship. Custom colors need to be special ordered. We currently accept Money orders and personal checks. For fastest delivery we recomend Postal Money Orders. We do have plans to be set up with paypal in the near future. Interested? Place your order here.